For starters, it's harder to find a place for beach camping in Norcal than it is in the south. Geography plays a big part: You'll find that you when you take the drive, going for miles along a spectacular road, atop steep cliffs that seem to drop into the ocean as straight down as the sides of a birthday cake. Then there are rocks. Even where you can get to the shoreline, it's too rough to be camping on. And then there's the weather. Days are colder in the north, and so is the water. But don't give up. 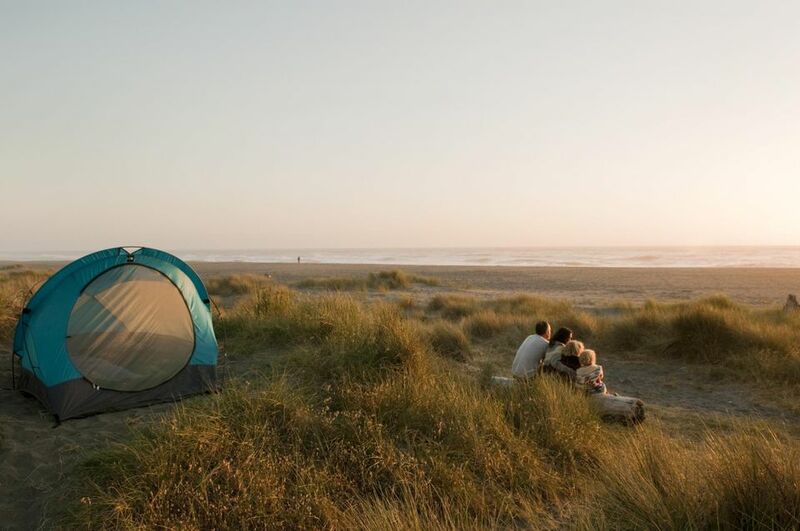 This guide to places you can pitch your tent (or park your RV) at the beach in Northern California was created by scouring the coastline to find places to camp from Santa Cruz County to California's northernmost point. You won't be disappointed by the locations because all of them are close enough to walk to the beach, not across the road or nearby with a glimpse of sand. Seacliff Beach is a picture-perfect place, guaranteed to generate some photos to share with friends and family. The campground stretches along a sandy beach, backed by vertical bluffs that block the wind. There's also an abandoned ship just offshore, and you can go fishing from the pier. This popular spot will be booked up months in advance, so start planning your stay ahead of time, using the Seacliff Beach camping guide. Sunset State Beach is - as Goldilocks might say - "just right." You can set up camp under shady pine trees and be on the beach in just a minute or two. It's 16 miles south of Santa Cruz. To get all the details, use our handy tips to find out how to snag one of those in-demand campsites, in the Sunset State Beach Camping Guide. North of San Francisco along Highway One, you'll find some of California's most jaw-dropping scenery. Use this guide Highway One north of San Francisco to see what it's like, and you'll be running out to pack up the car right away. As you drive, you'll find cliffs plunging straight into the sea and dramatic "sea stack" rock formations offshore, but few beaches and even fewer places where you can camp at one. These are the spots where you can go beach camping in Northern California, in order from south to north. Sonoma Coast State Beach and Gold Bluffs are both state parks, and if you have never used the state park camping reservation system, you'll find it frustrating and with so many rules that it would make a Supreme Court Justice's head swim. But don't worry, you can find out how to use it in this guide to California State Park Reservations. Sonoma Coast State Beach is a state beach with three campgrounds under the administration of the same state park. They accommodate RV's up to 31 feet long. The park is located between Jenner and Bodega Bay on Highway One, at least two hours' drive from San Francisco. This part of the coast has some of California's most dramatic coastal scenery, with massive rock formations offshore and crashing waves. Point Reyes National Seashore is California's most scenic coastal park. In fact, it's one of the most beautiful coastal parks in the country. Point Reyes has four hike-in campgrounds. Boat-in camping is also allowed on national seashore beaches on the west side of Tomales Bay, beginning north of Indian Beach in Tomales Bay State Park. There is no car or RV camping at Point Reyes National Seashore. Use this Point Reyes guide to find out about it. Clam Beach County Park: The name suggests one of the beach's most popular activities: digging for clams. The beach is near McKinleyville in Humboldt County, 280 miles and a six-hour drive from San Francisco. It's a small place with only nine tent spaces and nine RV spaces. The campground has vault toilets and cold running water. Gold Bluffs Beach Campground is part of the Prairie Creek Redwoods State Park. You can set up your tent between the Pacific Ocean and the redwood forest at Gold Bluffs. And here's a fun extra: You might find the local herd of Roosevelt Elk hanging out on the beach with you. When making your reservations, be sure you don't accidentally choose the Elk Prairie campground, which is not at the beach. Free beach camping in NorCal is one of those Internet fails that keeps making the rounds, copied by people who don't take the time to find out the facts. If you see anything about a free beach campground near Orick in Northern California, I can save you some trouble. After talking to a State Park Ranger, I confirmed that there are no free beach campgrounds in the Orick area. If you want to camp on the beach somewhere else in California, these are the guides to Southern California, Ventura County Beach Camping, Beach Camping Near Santa Barbara and the Central Coast Beach Campgrounds.